Box review from BestBackups, exploring the strengths and weaknesses of its support, security, pricing, and features including NAS compatibility. Box’s long list of corporate clients is a testament to its strong Enterprise plan, although personal accounts are more limited. File size restrictions and a lack of private key encryption are obvious downsides, but some good features and an appealing interface continue to make it a valid competitor in the personal backup market. You can read a detailed review below or sign up now. Box offers two personal subscriptions; Free and Pro. Free users will receive 10GB of storage, while a Pro account entitles you to 100GB for €8 (approximately $9*) per month. While Box’s personal plans are developed in their own right, the company’s primary focus is on Business users. Over 90% of Fortune 500 companies currently use their backup software and an extensive range of business features are available. For just €4 (approximately $4.50) per user per month, organizations can subscribe to the Starter plan, which covers up to ten users with 100GB of storage space and a maximum file size of 2GB. 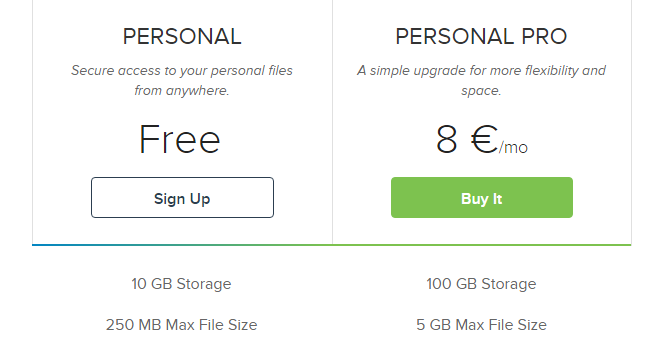 Larger teams looking for more space may prefer to opt for the Business subscription, which offers unlimited storage space, a 5GB maximum file size and additional security features for 12 EURO ($13.50) per user per month. A third option is also available for business users, called the Enterprise plan. This offers access to yet more features, and is custom made and priced to suit individual needs. Whichever plan best meets your needs, you can pay by Visa, Mastercard, American Express, and Discover cards. *Prices are calculated based on the exchange rate at the time of writing. Box was founded in 2005 by current CEO Aaron Levie and CFO Dylan Smith, while they were still at college. From humble beginnings, the California-based company has grown considerably and now serves more than 39 million customers, receiving multiple awards including the 2009 Silicon Valley Emerging Tech award for cloud computing. Today, their development is primarily focused on products for the Business market, with over 50,000 organizations opting for a subscription with Box. In 2015, the position of CSO was taken by Jeetu Patel, the former CEO of fellow online storage company Syncplicity. There’s no option to run automated or scheduled backups with Box, making it much better suited to users looking to manually select a smaller number of files and folders to store. Otherwise, however, it’s a pretty flexible program to use; you can backup data from an unlimited number of devices, and both the desktop client and website are easy to use. It does have one major disadvantage, however, as while there are very few restrictions placed on the type of files that you can backup to the Cloud, there are significant limitations on their size. Free subscribers can only upload documents of up to 250MB, while Pro users have a maximum limit of 5GB. This comes as something of a disappointment given that so many other providers allow uploads of any size, and is likely to limit Box’s suitability for many users. Box is compatible with Windows and Mac, as well as Android, Blackberry, iOS and Windows Phone operating systems. Box facilitates file sharing in several ways. You can allow people (both Box users and non-users) to view individual folders or whole files by generating a link, or invite other subscribers to edit, upload or delete documents by joining a shared folder. Given Box’s focus on business users, it’s not surprising that their sharing features have clearly been designed with teams and offices in mind. Their file sharing system encourages collaborative working, with shared folders easily accessible to all members, and the option for anyone to add or remove files. There is also the ability to leave comments and feedback on documents, to tag colleagues in order to notify them of relevant information, and to create new documents from scratch – making it easy for multiple users to work on a single piece of work at the same time. In addition to this, Box allows users to assign tasks to specific team members, as well as setting deadlines that can be integrated into Google calendar. File versioning is a feature that allows users to retrieve older drafts of their documents, and is an excellent way to find information that has been lost or deleted. While the majority of backup providers offer versioning services, they differ in how they are constrained; with some limiting the number of versions that can be saved and others capping how long they can be saved for. Box allows its users to access and download the last 100 versions of their documents, which is a reasonably good deal. While it’s outshone by providers who offer unlimited versioning, it is generous enough to be of practical use. Versioning is only available for users of Box Edit, which has to be downloaded independently, although documents created using Box Notes also have a version history. As well as versioning, Box also allows you to recover files that have been deleted from your hard drive for up to 30 days after their removal. I took a look at Box’s upload and download speeds, in order to give you as much information as possible about what it’s like to backup using their software. The speed tests were carried out by first uploading five individual files to Box storage space and timing manually how long it took for them to transfer. Next, I divided the number of MB in each file by the time it took in seconds. From there, I simply converted this number into Mbps to get the results. Exactly the same process was then applied to five downloads, and the results were added to the graph that you can see below. 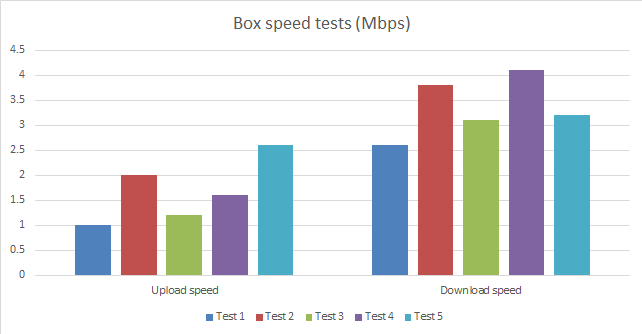 Box’s upload speeds weren’t particularly impressive, averaging just 1.7 Mbps – less than the 2 – 3 Mbps typical of most other providers. A 100MB file took around six and a half minutes to upload, which could make backing up large quantities of data a rather slow process. When it came to restoring files, a notification popped up to say that the process may be a little slow. Ironically, these speeds compared much more favorably to their competitors than the uploads, with an average of 3.4 Mbps. This result is still at the lower end of the spectrum, but taking between three and four minutes to download a 100MB file is relatively common for backup providers. I include speed test data in my reviews because it’s such an important factor when it comes to backing up your files. However, please do bear in mind that speeds can vary considerably based on external factors such as the strength of your broadband, so these figures should be taken as a guide only. Box Sync is a downloadable program that installs a Box folder on your desktop. By dragging or copying files into the folder, they will be automatically uploaded to the Cloud, and all changes made from you desktop will be automatically synced with its online counterpart. This means that the most up-to-date versions of all of your documents can be accessed from anywhere at any time. For those wanting to create and edit documents online with Box, there is also BoxEDIT– a downloadable added extra that allows you to open stored files with their native apps, then save edits directly back to the Cloud. This allows Box to effectively function as a virtual hard drive; a place where you can not only save your files but also create and edit them. Box Notes is a word-processor-style interface that subscribers can use to create documents directly from the Box website. Somewhat similar to Google Docs, other users can make edits and add comments to Note content, and formatting tools are available. There is also the option to generate a link in order to share notes externally. While Box Notes currently functions well as a collaborative tool, it seems strange that this feature is so limited. Box markets the feature primarily as a note taking device rather than a full-on word processor, but it seems that this could easily be extended. Given that it’s a fairly new feature, however, it’s possible that such developments will be seen in the not-too-distant future. If you want to share your files directly to a blog, website, or wiki, Box allows you to embed them directly into your chosen page. Once again, there are no limits on the type of files you can embed, so you’re free to add anything from text, music and images to PDFs, slideshows, and even videos (although your account’s file size limitations still apply). If you want to limit how much other users can do with your files, then you also have the option to determine whether or people can share, download and print them. Although I don’t typically discuss business plans in reviews, as so much of Box’s high-quality content is featured in their Business and Enterprise plans, I thought it was worth giving it a mention. The main advantages are related to security, with Enterprise Key Management allowing organizations to manage their own encryption keys (see more on this below). Access to other integrated software is also available, along with greater control over permissions and account management. Companies also have access to significantly more storage space, and the flexibility to change file size limits if required. All data backed up using Box gets the benefit of 256-bit AES encryption, and is transferred using high-quality TLS. As Box’s encryption is end-to-end, your data will be protected at all times, including during all sync and share processes. Unfortunately, Box does not currently offer personal users the option to set their own private encryption keys, which is the best way to ensure that no-one else can access your data but you. Enterprise users have more luck in this respect, as Box recently announced the Enterprise Key Management (EKM) feature, which is designed to allow companies to manage their own private encryption keys. The idea here is to make data ‘NSA-proof’ – aka. impossible to access by anyone who does not possess the key, whether they are poking around in your files legally or not. Business security measures also incorporate other features, including the ability to turn Cloud provider access to company data on and off, all designed to keep control firmly in the hands of their clients. EKM is still patent-pending, and there is currently no personal version available. This is disappointing as private key encryption is an essential part of maintaining your data privacy online, but I hope that with the advent of EKM, a personal option will be made available before too long. Box’s customer service options are extensive, if a little overcomplicated. 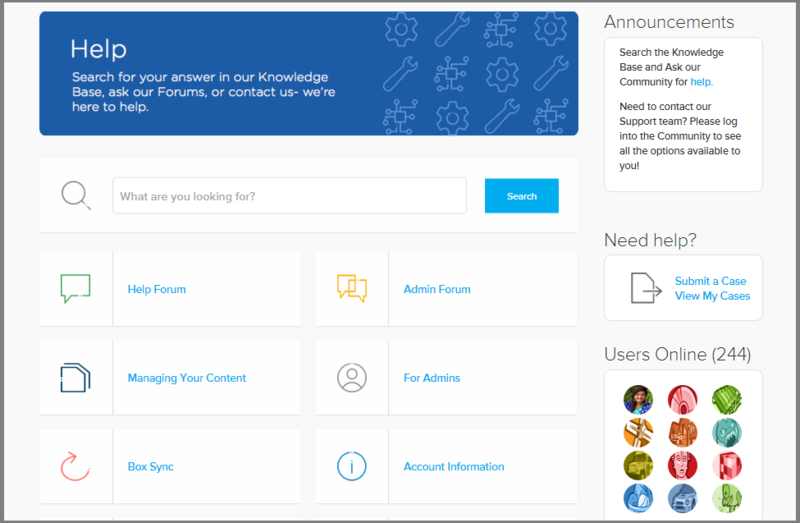 In addition to a standard support ticket system, subscribers are also able to log into Box Community, which contains regularly updated forums and profiles of all of their support staff. Here, you can view their activity and feedback rating, read their responses to previous queries, and add them as a friend or send personal messages. This system does admittedly give off an air of trying a little too hard (does customer service really require a mini-Facebook framework to be effective? ), but it’s nice to feel that you can make an independent choice of who to contact. Customer service in general is infamous for employees being anonymous and often under-qualified, so by making their staff details available to all members, Box does go some way towards overcoming these criticisms. In addition to contacting staff directly, you can always turn to Box’s Knowledge Base for information and troubleshooting advice. Both videos and articles are available on an impressive range of topics, and information is all clear and detailed. I sent a couple of support requests Box’s way and were pleased with their replies. Every issue was resolved in between four and eight hours, and information was helpful and detailed. I had some trouble explaining my inquiry on one occasion, but a few emails back and forth resolved the confusion, and I got a satisfying result in the end. While this did cause a bit of a delay, I appreciated them making the effort to send a useful reply. You can also select the severity of your problem when you submit an inquiry, so that more serious problems can be prioritized, and those in more urgent need of a reply receive a faster service. Box runs a Facebook page, blog and Twitter account, all of which feature regular updates on company and industry news. Their Twitter boasts more than 68,000 followers, and a Box Support account is also on offer, providing updates and guidance on technical issues as well as answering user queries. BoxWorks is an annual conference hosted by Box, featuring talks and discussions by representatives of industries as diverse as IT services, movies and healthcare. Discussion is based around the ways in which technology will shape the future, and contributions are invited from across the board. Representatives of IBM, Apple, and Pixar all made keynote addresses in 2015, and appearances were also made by public figures including actor Jared Leto. Tickets are available to the public, and the majority of events are filmed and available to view on Box’s YouTube channel. As many of Box’s features can be used from their website alone, getting set up is just a matter of registering. Only a name and email address are required for a free subscription, and those opting for a paid plan only need to hand over their address and card details in addition to this. Registering online grants you immediate access to all website-based services, including uploading and retrieving files, creating folders, using Box notes, and changing your settings. You’ll also get a handy introduction on your first use to help you along the way. If you want to upload files from your desktop, you’ll need to install Box Sync. As well as simplifying the backup process, this also allows you to upload or download folders; a useful feature given that only files can be transferred from the website. There is also the option to install Box Edit, which doesn’t have its own interface, but facilitates the editing of Box files in their native applications. When performing basic tasks like backing up and retrieving files, Box is very user-friendly and simple to use. The web interface is attractive and intuitive, and Box Sync acts just like any other folder on your computer. I had more trouble when I wanted to use their extra features, particularly Box Edit, as their website lacks clear instructions for use, and descriptions of the program are mostly vague. The Box mobile app is very versatile, as well as being easy to navigate and use, with a tutorial available when you first get started to point you in the right direction. As well as viewing your stored files, you can also create sharing links, open files with other apps and leave comments on both documents and Notes. In addition to this, files located on your mobile device can be uploaded directly to the Cloud, and new Notes can be created. As a service for companies looking to backup their data, Box is an excellent choice. Business and Enterprise plans offer a broad range of features, comprehensive security measures and the flexibility to tailor subscriptions to individual needs. Unfortunately, personal users don’t get to enjoy all of these advantages, with significant limitations placed on storage space and upload sizes, and no private key encryption currently available. Having said this, when it comes to simple functionality, Box performs well – the interface is appealing, it’s easy to use, and customer service options are excellent. On the whole, Box is a decent option for personal subscribers, and a stand out for businesses. While those hoping to store large files or implement the very best in security measures may wish to look elsewhere, interesting features and impressive customer service will appeal to many users. What do you think of Box? Leave a comment with your thoughts.